Update! And Another Update! And Yet Another! In September 2015, Pete Doyle pointed out that there were pictures online of one of the people mentioned here. Thank you, Pete! See them at the bottom of the page. Then in February 2016, Pete found another one. Wonderful! In Marc 2014, David Kerrison contacted us from Ireland to to say that Joyce was his grandmother! It is astounding that a few lines on a century-old piece of card can weave a story that reaches to the present day. David kindly sent us a picture of his great-grandfather’s briefcase. This postcard deserves special treatment because we can find out quite a lot about it, and it involves some interesting people. It was collected and provided for copying by Nathalie Muller and Robert Berkeley. I (EJW) put it online and found out the details. Copyright status on this postcard is not known. If you think you own the copyright on either the picture or the words and would like this removed, please get in touch. But I hope we can keep it because it’s fascinating! Here are the front and the back of the card. Click either picture for a much bigger version. The postcard is one of the E R Lovell series, published by the proprietor of the village store and post office. The picture is of Linden Lodge in Tyrells End, which is still there today. Mr & Mrs Ogle, “The Stone”, St Lawrence Bay, Southminster, Essex. We arrived home quite safely about half past five. We had a puncture just outside Chelmsford and something went wrong with the engine but otherwise we were quite alright. I am looking forward to half term but it does seem a long way off. I hope you will have fine weather the rest of the time you are there. It does seem horrible stuck right out here with nothing at all to do. Give a kiss each to Sylvia and Billy for me. Much love Joyce. Who was Joyce? Who were the Ogles? What was going on? Read on! Joyce wrote, “Sat 3rd 1921”, but which month? The postmark’s not readable. There are plenty of old calendars online, like this one. That reveals that there were two Saturday 3rds in 1921, in September and December. Joyce was “looking forward to half term” so it must have been Saturday 3rd of September 1921, or she would have been looking forward to Christmas. It’s still in business today. Back in 1921, it seems likely it was running as a hotel. 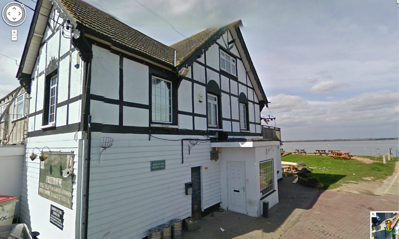 Here’s the pub website, which is reassuringly disorganised. If you want to visit, they’re on 01621 779215. Head of the household was Alfred Thurston Mills. That’s a familiar name, because he already has his own webpage here! He was headteacher of Eversholt School. He’s almost certainly the chap with the moustache in the 1920 school photos. 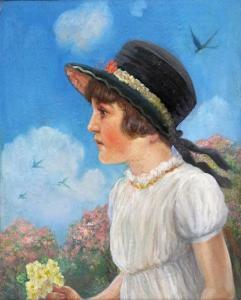 And Beryl Joyce is almost certainly there too, or the 1916 one, when she’d have been 9. The evidence that Joyce from the postcard is the same as Beryl Joyce from the census is quite strong. Joyce’s family was well-off – they’d have called it middle class, when we still had class – because they had a car in 1921, and went for summer holidays by the sea, and a headteacher would be middle class. Joyce is concerned with half-term, and a headteacher would be free to travel at half-term. Joyce sends kisses to tinies, and Beryl Joyce would be 14 in 1921, of an age to send kisses to tinies yet write with an adult hand. And Beryl Joyce is the only Joyce in Eversholt. So it seems reasonable to conclude, at least on the balance of probabilities, that Joyce was the headmaster’s daughter, and they lived in School House, Church End. Joyce would have walked 20 metres across the road to the village store to buy the postcard and stamp. Now, what of the Ogles? 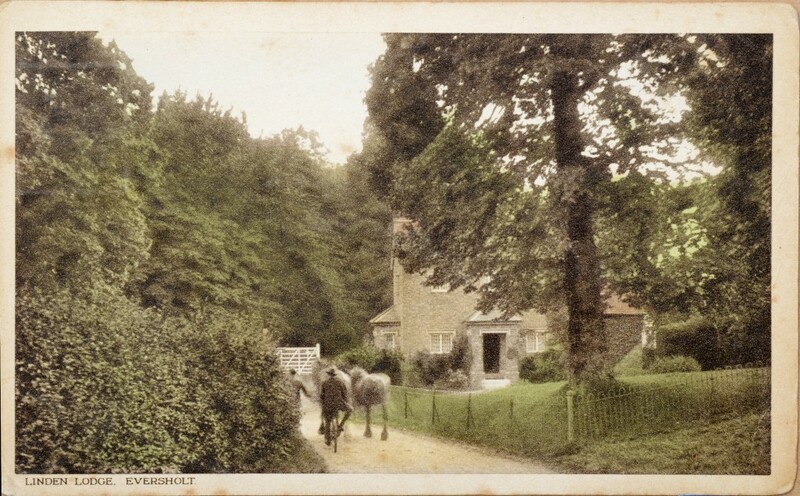 They may have no more connection with Eversholt than a teenage postcard – the 1921 equivalent of a single text – but they’re worth following. unfortunately, not Billy. But Ogle fils was called Richard, after his Dad, and could easily have been called Billy as a pet-name to differentiate him from his father. Who were Richard and Ruby? Were they of the right “class” (it seems as strange as asking if they were the right colour, nowadays) to mix with the Mills family? Here’s RIchard in the 1911 census, from Ancestry. He’s an art student – very middle class, and those three females at the bottom were servants. So, yes, the Ogles would be of the right “class” to mix with the Millses. Did anything become of Richard’s art career? Definitely! He illustrated the very first Enid Blyton book, 2 years later in 1923! He and Ruby celebrated their diamond wedding anniversary in 1972 – the notice is in The Times. And here’s his Times obituary, courtesy of Beds Library Service; click for a bigger copy, but here’s what it says anyway! Mr Richard B Ogle, illustrator and author, died on June 22  in a Bournemouth nursing home. He was 87. In 1908 he won a scholarship to the Royal Academy Schools where his tutors included John Singer Sargent and Solomon J Solomon. Unfit for active service he served during the first World War with the RAMC in this country. After the war a portrait of Sir Heron Allen was accepted for exhibition at the Royal Academy and was well reviewed, but it did not lead to other commissions, and the necessity of earning a living compelled Ogle to turn his attention to press work. Here he was greatly helped by his gift for line drawing so that by the early 1930s he had done a considerable quantity of book illustration and the covers for many of the popular novels of the day. Ogle also produced colour plates for the Graphic, the Bystander and the Queen, had a long association with the Boy’s Own Paper, and for some 30 years was the artist responsible for the little drawings illustrating the predictions in Old Moore’s Almanack. He did not attain the eminence of some of his contemporaries, but he enjoyed the reputation of being an artist who could always be trusted to bring to his work sound draughtsmanship, painstaking attention to detail and a wealth of artistic ideas. in later years he took up writing and was the author of more than a dozen books written for young people which he illustrated himself; of these, the ones he would most wish to be remembered are a collection of lavishly illustrated books on animals. He illustrated no fewer than eight of the Epworth Children’s Classics. In his spare time he painted landscapes in watercolour and in the same medium innumerable studies of sea and sky. They display keen powers of observation and an abiding love of nature. In 1912 he married Ruby Emma Mary Palmer, by whom he had a son and a daughter. So, Beryl Joyce Mills, daughter of the headteacher at Eversholt School, lived in School House from an early age. She went to Eversholt school, and we almost certainly have her photo, but we don’t know which child she is. 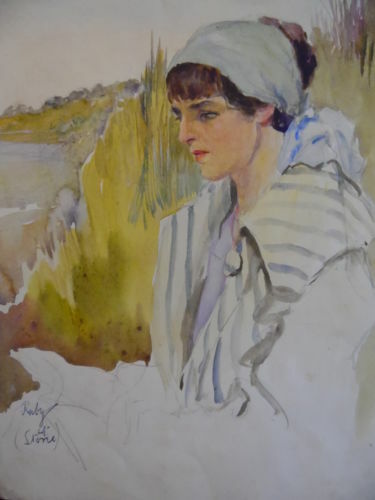 In 1921, when she was 14, the family took their car down to the Essex coast and stayed by the sea for a holiday. There, they met the Ogles and their two young children. 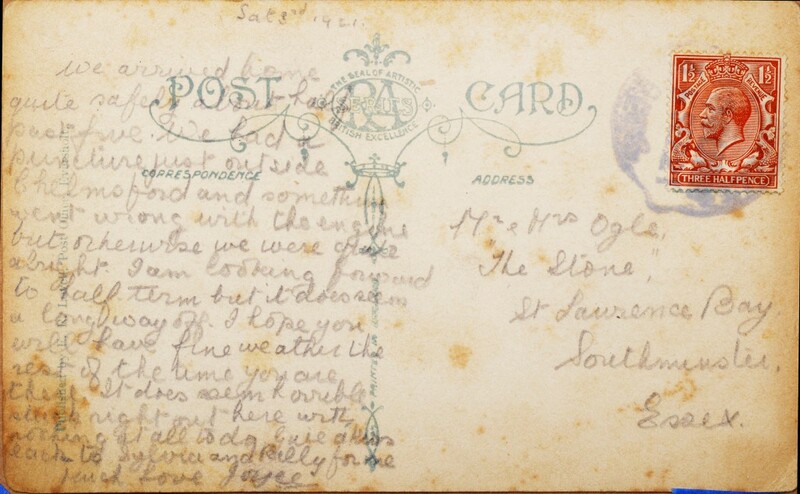 When Joyce reached home, she wrote the Ogles a postcard to let them know they were home safe. Richard Ogle went on to have a distinguished career, and the Ogles were married for over 60 years. What a lovely story to fall out of a postcard that was the work of a few minutes and survived by chance! Did these people have descendants alive today? If you know anything more, please leave a comment! Richard Ogle painted multiple pictures of Sylvia. Pete Doyle pointed out copies online, and one is reproduced here. If you own the copyright to this image and wish it removed, please get in touch. It came from an auction reporting website, arcadja.com. To find more, type “Richard Bertram Ogle Sylvia” into a search engine and choose images – good luck! The above image must have been very close to the date of the events here. Pete Doyle found this picture of Ruby Ogle and very kindly gave us permission to reproduce it here. The caption says “Ruby at Stone”. Does that mean it was actually painted during the holiday at The Stone when Joyce met the Ogles? What a discovery!